Good Morning, Vietnam was next, since it was the most kid friendly. While dad liked Robin Williams' antics as the rogue Armed Forces Radio Network host, he told me afterward that everyone in his unit hated the DJ, who got to sit in a studio being cheery while the infantry was getting shot at in the rain (but they still listened to him because he played good music). When I was old enough to handle gore, the floodgates opened. Saving Private Ryan became a lesson in what an amphibious landing was like. Hanoi Hilton and various documentaries taught me about POWs. After each film my dad debriefed me, critiquing each movie's realism. 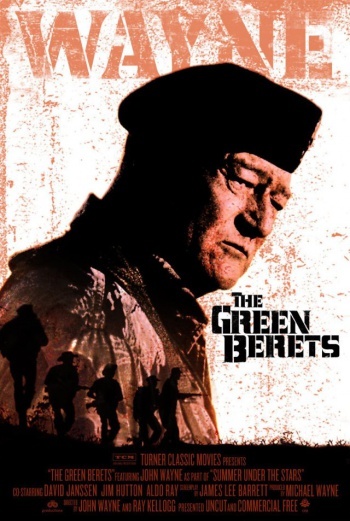 He derided The Green Berets, an uncritical and optimistic John Wayne movie that was made before the war was even over. Platoon was technically accurate but overblown-in my dad's view Oliver Stone distorted the war, taking everything bad that happened during Vietnam and smashing it into two hours. Apocalypse Now wasn't historically correct, but captured the internal struggles troops went through while operating far outside mission parameters and proper oversight. He was particularly fond of We Were Soldiers, since not only did the film emphasize helicopter insertions and radio operators, it was also set earlier in the war when morale was higher and drugs weren't as much of a problem as they were after he mustered out. His favorite Vietnam movie, oddly enough, was Forrest Gump. Not only did Forrest serve in the 9th Division, but according to my dad everything about their uniforms and environment was spot-on correct-even the hand-painted signs around base camp. It seems trivial, but Vietnam movies made it safe to discuss the war. They helped my father share himself with me, piece by piece. Meanwhile, he served as a guide and guardian, helping me decipher reality from Hollywood myth. It's the same thing I try to do with Critical Intel. When I point out an inaccuracy or elaborate on a game's successful depiction, the goal isn't merely to criticize the game but to use it as a launching point for educating the audience. Games are full of teachable moments, whether it's George Washington stepping down from power or concerns about U.S. drone policy. Even a thoroughly bad game like Call of Juarez: The Cartel can teach readers useful lessons if you're willing to lance all its lazy assumptions like boils, then disinfect them with well-researched facts. We need this now more than ever. And as games become increasingly convincing simulations of real-life topics and subjects, we need writers that are able to separate truth from showmanship. This is especially true for the military game genre, since it tends to fetishize realism while rejecting anything that would make combat "un-fun"-despite the fact that combat isn't a fun experience. While I can write about this area, I'm an imperfect guide. Unlike my father, I have never been to war. I can analyze policy, read reports and make arguments based on an academic conclusion, but I'm not the right person to describe whether Battlefield 4 authentically recreates the feeling of being shot at. I will always come to that experience as an outsider. We need veterans writing about games, and we need them badly. One of the major failures the games press made this decade-and I include myself in this-is that we've allowed military games to dominate the industry without seeking comments from men and women in uniform. This is thankfully changing. Jacqueline Cottrell recently published an interview asking two military women about how they felt about how games represent female soldiers. Last year the anonymous editorial Call of Apathy was shortlisted for the Games Journalism Prizes. Also last year, journalist Kris Ligman interviewed her friend, an Iraq vet, about his thoughts on Spec Ops: The Line. But these are the exceptions rather than the rule, and games journalism lacks a consistent voice that can discuss combat in an educated, experienced manner.